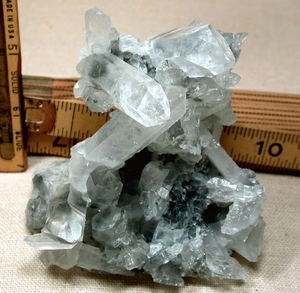 Rare blue Arkansas phantoms self-display in an unusual "X"- marks - the - spot quartz cluster with a MANIFESTATION crystal inside a bright transmitter. 2 3/4x 3 1/2x 3 3/4" standing up. Exposed manganese glitters with a little drusy at its' back side. Points to 2". Rainbows, a double Isis faced tabular crystal, some contact damage under the "X", penetrators, regrowth.